NATURAL HAIRLINE? There is much more to it than you think! Why is money responsible for the lack of natural hairlines today? We have to look back at the history of hair transplant surgery to understand. In the late 1990's hair transplant surgery started to finally emerge from the dark ages and natural hairlines possible. Many clinics talked about natural hairlines but no one could really produce them properly. This was because the procedures had not been developed to do so. The problem wasn't technology, the technology existed as long as modern surgery has existed. It was the combination of existing technologies that allowed for natural hairlines to finally be achievable. The combination of technologies consisted of a single blade scalpel for removing a donor strip with low transection rates and the use of stereoscopic microscopes to properly separate naturally occurring follicular bundles or follicular units. A monk named Cherubin d’Orleans invented the stereoscopic microscope in 1677. Over 300 years later Dr. Bobby Limmer of San Antonio, Texas realized the benefits of using stereo microscopes in hair transplant surgery. They allowed clinics to dissect donor tissue into their natural follicular groupings including single hair grafts as needed. In many cases microscopes allowed clinics to CREATE single hair grafts out of multi-hair grafts when necessary. Truly natural hairlines will have a majority of single hairs in the front few millimeters of the hairline. While some double hair grafts will exist naturally in hairlines it is always an extremely low ratio. Dr. Limmer wrote about this in the 1990's and "follicular unit hair transplantation" became the standard of care worldwide. The quality of hair restoration results increased exponentially solely due to the this development. Forget the beard, the hairline is filled with multi-hair grafts that scream hair transplant! In the early 2000's a challenger to this new standard of care began to get some attention. This challenger was follicular unit extraction or "FUE", as introduced by Dr. Ray Woods. FUE was created and exists so patients could avoid a strip scar. More natural results and better growth are not why FUE was invented. In fact, FUE is inferior for both issues. I have said this since 2002. FUE still isn't as good as strip surgery for naturalness or survival rates as it is performed by most clinics. There are clinics that have survival rates close enough to good strip surgery that the differences are inconsequential. These same clinics have achieved a parity regarding naturalness as well. For nearly twenty years debates have raged about survival rates but not naturalness. The details of what is and is not possible with FUE in this regard have been overlooked in these debates. This article shares the facts about FUE and why it is inferior as it is performed by more clinics. When FUE practitioners try to extract a follicular unit there is a major challenge to overcome. We cannot see into the scalp tissue to know for sure how many hairs are in each follicular unit. This is because when hair transitions throughout the three stages of growth all of the hairs in the follicle are not always in the same state as other hairs in the same follicle. A single hair graft may in fact be a double or triple hair graft. Microscopes are necessary to see into the tissue after the follicles have been dissected from the donor strip. This is the only method that allows allows for true single grafts to be used in a hairline. If a double hair graft is really a four hair graft this can only be determined with microscopes. 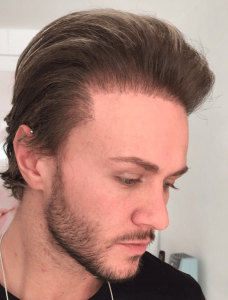 The second reason why FUE does not produce natural hairline results is because of how fragile grafts are. There is a strong chance of follicular damage or death when single hair grafts are targeted. This is why multi-hair grafts are targeted more often than single hair grafts by FUE clinics. Only the most experienced FUE clinics can target single hair follicular units with a high degree of survival. This is a detail that most clinics do not discuss with patients. However, I have been in surgical meetings and conferences where this very issue is openly acknowledge and discussed. This means that more grafts that are being placed into hairlines by FUE clinics will have an unnatural appearance, inconsistent density, and plugginess. With the low threshold of entry into the field, almost anyone can open an FUE clinic. Plastic surgeons that specialize in multiple aesthetic disciplines, and may even have years of general cosmetic surgery experience, are now offering FUE as an adjunct to their existing menus because they purchased or leased an FUE machine such as a Neograft or an ARTAS. With a minimal amount of training they begin performing FUE hair restoration surgery without an understanding of what should go into a proper hair restoration procedure, much less what makes a natural hairline. This is why the hair restoration industry in general has started moving backward as it is easier and easier to enter the field and the marketing dollars to drive leads has helped to reduce the procedure to being a commodity rather than a speciality. Stereoscopic dissecting microscopes used to be a standard piece of equipment that I urged patients to seek out when considering various hair restoration doctors as this helped to separate the ok or even good results from the great results and the great results would always include a natural hairline (more or less). This would ultimately be the difference between proper follicular unit transplant surgery and mini-micro graft surgery. Stereoscopic dissecting microscopes are the only way to insure a hairline is made up of natural single hair grafts. This is increasingly being ignored as more clinics open for business. For the majority of FUE only clinics performing hair restoration, the focus on growth rates and how many grafts can be removed safely, have overshadowed naturalness. In fact, if you look at all of the major FUE only clinics in the world you will see a higher percentage of double and even triple hair grafts in the hairline than when you compare the hairlines from better known clinics that still have microscopes from when they performed, or still perform, follicular unit strip surgery. THIS is the difference that separates the true artisan clinics from what I refer to as the "brute force" clinics as they lack the refinement and finesse that only stereoscopic dissecting microscopes can provide. This is why money is the underlying reason for the decline of the overall quality of results we are seeing within the hair restoration industry at large as it is financially inefficient to add the cost of equipment, the training for said equipment, and the additional staff needed to produce natural hairlines on par with the best FUT results in the world. So what is a "natural hairline"? A natural hairline is one that is soft and does not draw attention to those around you. The last thing you want is for those that you are speaking with to start drifting their eyes up toward your hairline instead of looking you in the eye. I have personally experienced this in my own life before my hairline was repaired, yes, with single hair grafts, by Dr. Wong. To have this experience is one of the most humiliating experiences you can have and it ultimately left me scarred for life. My stomach still sinks when I think of that unfortunate chapter of my life and I thank God every day for having a natural hairline again. You do not know misery as a hair loss sufferer until you have your loss replaced with an unnatural appearance. But hairlines require more than single hair grafts to appear natural. They also have to have a continuity for the direction and angle of the placement. They have to be placed in a density that works for the hair type being used. For instance, if one has fine hair and a low color contrast to the recipient scalp, a low density transplant can still look very natural as the key is for the hairline to not look manmade. Coarser hair needs to be placed at higher densities as even single hair grafts with coarse hair can have a pluggy appearance but this is one of the details that are addressed with experience and understanding by the doctor and is a subject for another article. Even the worst hairline designs can benefit from single hair grafts but ultimately, a natural hairline must include multiple considerations to avoid situations like this. For patients that are seeking the "best deal" for their hair restoration, your priorities are in the wrong place. You have to ask your chosen clinic if they use microscopes to create hairlines because this is the first requirement for achieving a natural result. Even the worst hairline designs can be improved if the placement includes all single hair grafts so that is why stereoscopic dissecting microscopes should be a standard requirement for your hair restoration needs.